Navratna Ring With your lucky no. Navratna Pendant With your lucky no. 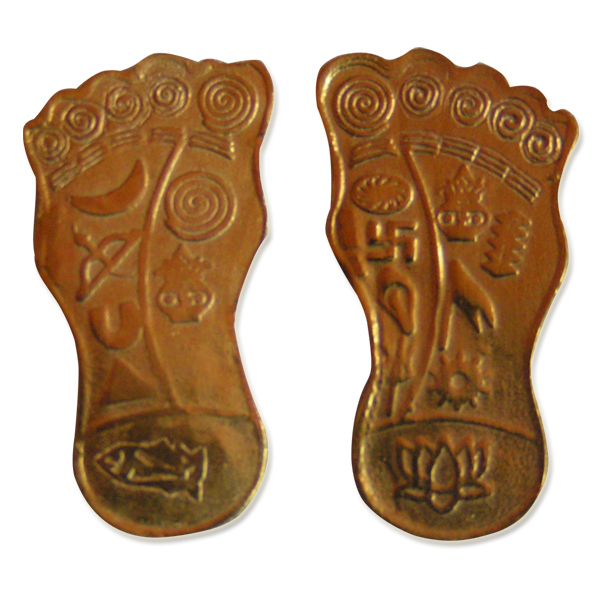 Laxmi Paduka is a rare Lucky Charm very well described in Vedas and Puranas. It is believed that Devas and Asuras performed Samudra manthan (Churning of ocean) with the help of a mountain on the advise of Lord Vishnu to extract rare gifts, called Ratnas. In all 14 such ratnas were extracted and were equally divided by the Devas and Asuras. These ratnas were, Halahal (poison), a horse named Uchaswah, a white elephant called Airavat, a rare gemstone called Kaustubhmani, parijat vriksh (tree), Panchjanya shankh, Shaag dhanush, a holy cow called Kamdhenu, Chandrama (the Moon), Mahapadma Nidhi, Rambha, Varuni madira, Amrit and Dhanwantari vaidya. Goddess Lakshmi emerged as fifteenth ratna in the bridal attire with lotus mala in her hand for Lord Vishnu or Narayana. Everyone hailed the Laxmi-Narayana and Goddess Laxmi set her foot on haven. Her feet had in all 15 symbols, which brought prosperity in haven. All gods took impressions of Lakshmi’s feet, called Lakshmi Paduka and installed at their places and celebrated by lighting lamps. This marked the festival of Diwali. a) Teer Kaman (Bow & Arrow) – It is weapon of gods and good to achieve one’s Lakshya or objective. b) Matsya (Fish) – Symbolises prosperity & health. c) Kumbha (Pot) – Symbolises good health and fulfillment of desires. d) Chandra – Brings light & purity in your lives. g) Vajra – Its Lord Indra’s weapon. It does not allow you to loose focus. 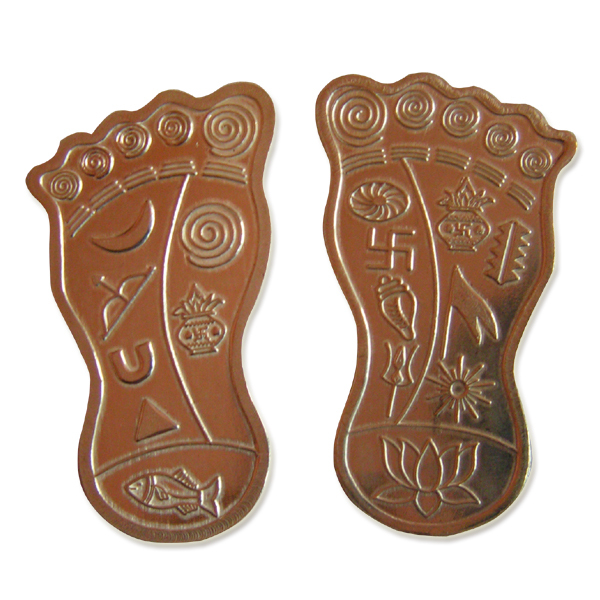 It is believed that by installing Laxmi paduka at place of worship at home, office or at place of work, everyone gets health, wealth and prosperity. Wash the Laxmi Paduka with Panch Kavya (Mixture of milk, curds, ghee, go-mutra & go-dhan) and then wash with water. Alternately it can be washed with Panchamrut (Mixture of milk, curds, ghee, honey and sugar) and then washed with water.